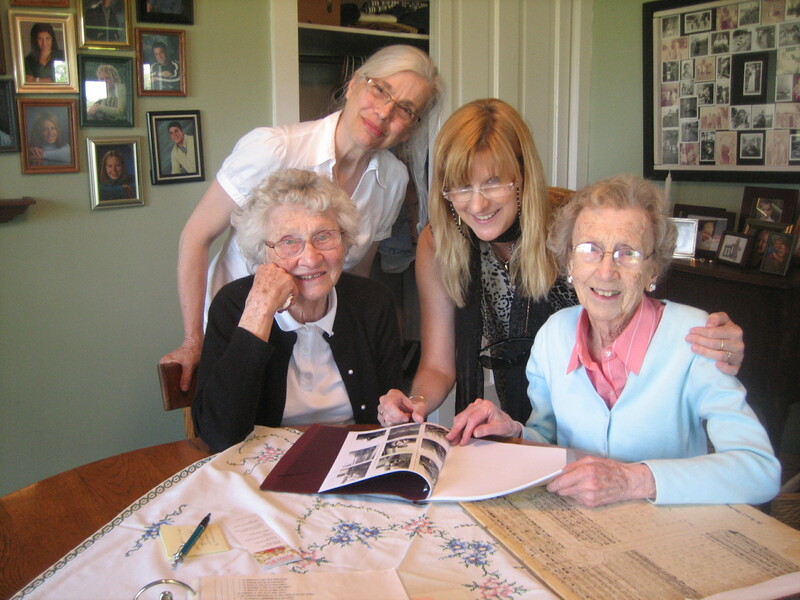 Cousin Mary stands with me along with Marion and Ann who are seated. Visiting relatives for me has always meant listening to family stories. “What was it like when you were growing up?” I’d ask my aunts and uncles, longing for their descriptions of what life was all about during the roaring twenties, the depression and the war years. During my recent trip back to my native state of Wisconsin, we cousins reminisced and pieced together our family tree without those aunts and uncles, as they’ve crossed over into another world where we can’t ask them questions any longer. One afternoon my cousin, Mary and I gathered with our dads’ cousins, Ann and Marion, both in their 90s, the last of their generation. Photo albums were spread around us. “Tell them about the fire,” said Marion to her older sister. “How did the fire start?” I asked. “One of the children put the clothes on the stove,” said Ann. “One of the children!” exclaimed Marion. “Well, it certainly wasn’t the baby,” said Ann. We all laughed as we realized she had done it. Although the house was destroyed, young Ann grabbed the baby and got out safely. That day, we bonded over family narratives. What tales do you have to tell? Create a timeline of emotional events for yourself. They don’t have to be life-threatening or tragic. It could be the day in third grade you discovered your gift of making people laugh. Or the time you hit a home run for your baseball team. Flesh out these memories with details and recreate them as personal stories. Interview family members for their memories. A good book to help you is Legacy: A Step-By-Step Guide to Writing Personal History by Linda Spence. Invent a memory timeline for your protagonist. Flesh out a few of them creating back story for your character. Use a family story to inspire a poem, song, or other piece of art work. Calling All Teen Writers in Contra Costa County! This is an open and free group (8th-12th grade preferred). Just bring paper, your favorite writing tool, and enthusiasm!